Sorry I'm not keeping up with the blog but without internet in the room or even at the hotel it's really hard to find the time to get here. Then once I'm at the internet cafe Alexis and Mom don't find it very entertaining to watch me type. 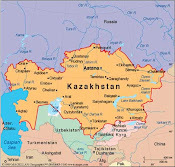 The quick version of our status is that the Kazakh Passport is hung up in Astana because they no longer accept the Power of Attorney I was told to sign, notorize and Apostille in the state. They wanted one from here so Flora had one drawn up today, I signed it several times and so did Zina for some reason I don't understand. Then they rushed it to the airport so that it could be flown to Astana. Hopefully it will meet up with Alexis' Kazakh passport tomorrow, get registared - whatever that is - and then flown back her on Wed. The bottom line is we are still in a holding pattern until it get's back here. Lexie is just such a good baby I feel blessed with any time I get to spend with her even if it is in a cramped little hotel room or driving around in a hot little car with Mom, Lexie, Rosa, Irene & myself stuffed in the back seat or walking the streets of Almaty looking for some great local treasures that I can give to Lexie on each of her birthdays. I have done fairly well with that project. I have 13 of the 18 gifts I want for her birthdays which I plan to give her so she can have something from her birth country each year. Of course I will also be bringing home at least one more suitcase. Hey that can be for her 18th birthday when she's going off to college. I'll just get a KZ bumper sticker and slap it on it. Now I only need 4 more gifts. See life is good in Kazakhstan. I'm getting the evil eye from Mom so it's time to wrap it up. I hope everyone is doing well and I'll try to bring my flash drive with more pictures next time.